So I am back with the second installment of the Superhero Challenge. After my evil Red Skull nails I needed to do a Marvel Hero. I have been quite lucky with this challenge thus far as I have had some nail art bits lying around the house that I haven't used yet. This time I wacked out some super cute nail art decals that I grabbed about 6 months ago on Ebay. For my Hero nails I actually have done four hero's who make up on amazing team (there are others in this group but we will ignore that for now!). Can you guess who they might be? That's right Avenger nails! Ignore my yucky cuticles. This is my right hand which I never use to take photographs of. 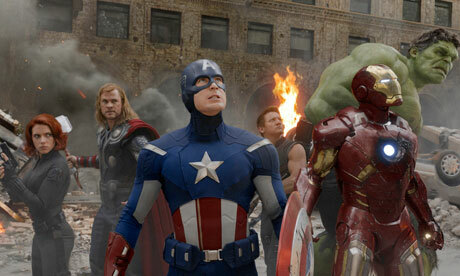 Anyway here is from L-R Captain America, Iron Man, Hulk and Thor. That's right they are Hello Kitty style! Eek! Arn't they cute? 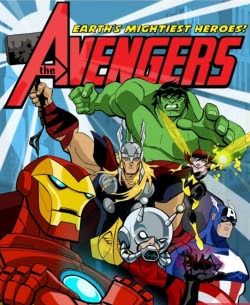 The Avengers is a team of superheroes, appearing in comic books published by Marvel Comics. The team made its debut in The Avengers #1 (Sept. 1963). So this Manicure features some water-slide decals from Ebay and two coats of Color Club's Worth The Risque. A scattered silver holographic polish which is really quite special. Next week we are moving on to DC! Oh my goodness! These are supercalifragilisticexpealadouscious! I am very jealous of your stickers. These decals are adorable! My favorite Avenger is Iron Man.